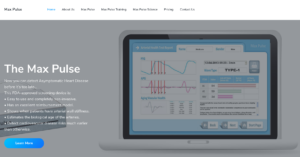 We recently created a new website for a medical device called a Max Pulse. Creating original content that reflects the device and its product offering is very important. The content must be original and the content must be interesting and engaging. In this case the Max Pulse is a device of interest to doctors, so the content can be more technical in nature, but even so, content that is too technical is no longer engaging and even members of the medical profession would prefer simple and easy to digest information.